Taloneus joined the cult while barely a teenager. He likes watching the world burn, cats, watching the sun rise, especially when the smoke from a burning world tints the clouds those amazing reds and purples. Rumor has it that Taloneus eats the cats that he collects, as he never seems to have more than two or three at a time, but in actuality he trains them, cybernetically augments them, and then releases them into new environments. Of course the rest of the cult never sees this as they rarely visit worlds they’ve ravaged in raids, but even if they do who is going to notice a slightly increased feral cat population. Taloneus is most adept with the physiology of animals, but is a practiced hand with humans as well, and is the closest things the cultists have to an Apothecary, though what cyber-limbs Taloneus has installed have really only taken with extensive blessings from Slaanesh, it’s pretty obvious w/out divine (as far as the cultists are concerned) intervention most of his modifications wouldn’t have taken. That said not all of his “improvements” have been successful; his ministrations are usually sought as a last ditch effort as several recipients have died or rejected the implants. He claims they were weak of faith, andthis is widely accepted to be the case. 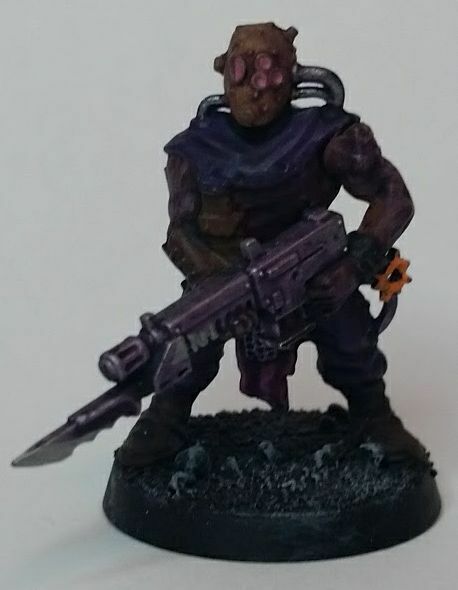 There was even one time when another cultist’s devotion was called into question and as a means of testing his faith they cut off Rhygore’s left arm, and had Taloneous replace it with a mechanical tentacle. Fortunately for Rhygore Slaanesh smiled on him, after distinguishing himself in the next raid the arm grew a fleshy covering, giving super human strength, and setting to rest any possibility of lack of faith on his part. This entry was posted on Friday, November 24th, 2017 at 8:30 am	and is filed under Meet the Cultists. You can follow any responses to this entry through the RSS 2.0 feed. You can leave a response, or trackback from your own site.